Imarti or Amriti or Jhangri is a dessert invented in Mughal kitchen and is now popular in Rajasthan, West Bengal, and South India. 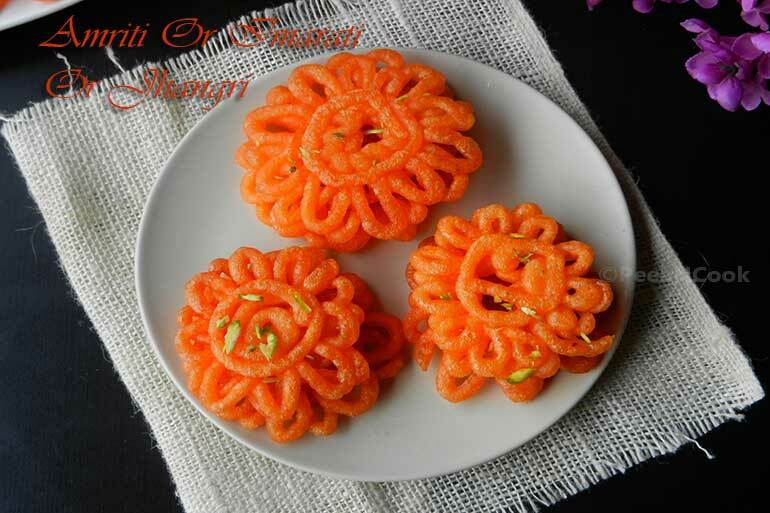 Imarti is made by deep-frying urad flour batter in a kind of circular flower shape, then soaked in sugar syrup. Strain all the excess water of the urad dal and keep aside. Now take a food processor and add 1/4 cup of water to it to make it wet. Now add the urad dal and grind it to make a smooth paste. But turn on the food processor for 30 seconds and take 5 minutes of interval, to make the food processor cool down. Make sure the batter is not warm. It will take at least 30 minutes to grind the dal. Pour the ground dal in a large bowl, add the rice flour and the food color and mix the batter with hand for 2-3 minutes and keep aside. Now to make the syrup take Sugar and water in a pan and bring it to boil for 5 minutes, add crushed cardamom seeds and few saffron threads to it and turn off the gas. Take a zip lock bag and make a hole with a thin nail. The hole should be very tiny. Fill half the cover with the batter and first practice doing in a plate . Draw two circles, draw small swirl like circles over it. Just practice 2-3 times you will get it right. Then heat a broad, flat bottomed pan(keep the flame in low) with only little oil say 1 inch depth. The oil should not get fully heated, when it starts forming small bubbles in the bottom, then draw Amriti in the oil, repeat the same to make many. Once the Amriti gets cooked ,turn over and cook till crisp and then take out carefully and transfer to the sugar syrup for 2-3 minutes, take them out from the syrup and keep on a serving tray. If you like my recipes, please go and like my Facebook Page. Lentil batter fired sweets should be served hot. Otherwise the crisp will be gone.